Background: Guillain-Barre syndrome (GBS) is an acquired inflammatory polyneuropathy characterized by rapidly progressive symmetrical flaccid limb weakness and areflexia. Here, we aimed to describe GBS on the basis of clinical features using Hughes scoring system (HSS) in children. Methods: We conducted a descriptive study, retrieving medical records of children between 2–16 years old admitted with GBS during January 2011–December 2013 at Aga Khan University Hospital, Karachi. Information on demographics, predisposing factors of GBS, clinical features at presentation, investigations, managements, short- and long-term outcomes were recorded on data extraction sheet. Ethical approval was obtained before data collection. Results: Totally 31 children with GBS (21 males) were admitted during the study period. The mean age was 6.7 years. Thirteen cases were seen in summer (January–October) followed by 11 in spring (March–May) and 7 in winter (November–February). Preceding illnesses including upper respiratory tract infections in 15 and diarrhea was seen in 4 patients. None of the patients had history of prior immunization. The nerve conduction study/electromyography showed acute inflammatory demyelinating polyradiculoneuropathy in 18 (58%), acute motor axonal neuropathy in 8 (25.8%), acute motor and sensory axonal neuropathy in 3 (9.7%) and Miller Fisher syndrome in 2 (6.5%) patients. Twenty-one patients had received intravenous immunoglobulin, four had plasmapharesis, four had both while two patients received none of these. Ventilator support was required by seven patients. Tracheostomy was performed on two patients. The HSS was calculated at 3-month follow-up. Nineteen children (61.2%) had an HSS score of 0–1, eight had a score of 2–5 (25.8%), and four patients were lost to follow-up. Conclusion: HSS is a good tool to identify and follow children with GBS. More than two-thirds of the patients had recovered complete mobility at 3-month follow-up. Background: Apoptosis secondary to ischemia and hypoxia is the main cause of spinal cord dysfunction. Because of the decrease in atmospheric pressure, patients living on the Qinghai-Tibet Plateau are in a hypoxic environment, which is very unfavorable for the recovery of spinal cord injury. Hyperbaric oxygen therapy can improve the postoperative function of patients with incomplete spinal cord injury, and its effect is better on the plateau than at normal altitudes. We performed a prospective randomized controlled clinical trial to observe the effect of hyperbaric oxygen therapy on traumatic spinal cord injury in patients living on the Qinghai-Tibet Plateau and are currently analyzing the results. Methods/Design: This prospective, open-label, randomized controlled clinical trial was performed at the Department of Spine Surgery, Affiliated Hospital of Qinghai University, China. In total, 164 patients with incomplete traumatic spinal cord injury were equally and randomly assigned to a control group and a hyperbaric oxygen therapy group. Patients in the control group were treated with pedicle screw fixation and decompressive laminectomy. In addition to the surgical treatment performed in the control group, patients in the hyperbaric oxygen group underwent hyperbaric oxygen therapy at 0.2 MPa once a day for four treatment courses. Ten treatment sessions constituted one course, and each course was separated by a 5- to 7-day rest interval. The primary outcome was the modified Barthel index to assess activities of daily living. The secondary outcomes were the American Spinal Injury Association (ASIA) impairment scale grade, sensory score, and motor score. The partial results demonstrated that after four treatment courses (55–61 days), the modified Barthel index and ASIA tactile, pain, and motor scores were higher in the hyperbaric oxygen group than in the control group. The ASIA grades were significantly different between the hyperbaric oxygen group and control group. The proportion of patients with ASIA grades D and E was higher in the hyperbaric oxygen group than in the control group. Discussion: The study design was finished in May 2012. Patient recruitment began in June 2012 and finished until February 2016.Data analysis will be finished in December 2017. In this trial, we aim to determine the efficacy of hyperbaric oxygen therapy on the treatment of incomplete traumatic spinal cord injury in patients living on the plateau and to provide clinical evidence for treating incomplete traumatic spinal cord injury in these patients. Trial registration: ClinicalTrials.gov identifier: NCT03112941. Ethics: The study protocol has been approved by Ethics Committee, Affiliated Hospital of Qinghai University, China in April 2012 (approval number: QHC011K). Informed consent: Written informed consent was obtained from relatives or legal representatives. Background: The optimal time to rescue spinal cord function after spinal cord injury is within 24 hours, especially within 3 to 8 hours, after the injury. Timely and proper pre-hospital first aid, hospital admission, patient assessment, and surgery are essential for the rescue of spinal cord function. A sound and rapid treatment system is the basis for improving the level of injury treatment and recovery of spinal cord function. China currently lacks a systematic and standardized treatment system. Methods/Design: We herein propose our study protocol for a prospective, multicenter, nonrandomized controlled trial. We will recruit 200 patients with acute spinal cord injury undergoing pre-hospital treatment at Beijing Emergency Medical Center and Beijing Red Cross Emergency Rescue Center and receiving in-hospital treatment at Peking University People's Hospital, Peking University Third Hospital, Beijing Friendship Hospital Affiliated to Capital Medical University, Chaoyang Hospital Affiliated to Capital Medical University, and Chinese PLA General Hospital, China. This study will comprise two parts: (1) establishment of a database of patients with spinal cord injury in the Beijing area; and (2) formulation of the pre-hospital and in-hospital process and establishment of a standardized treatment protocol for acute spinal cord injury. The primary outcome will be the American Spinal Injury Association impairment scale score for spinal nerve function. The secondary outcomes will be spinal X-ray, three-dimensional computed tomography, and magnetic resonance imaging findings and the incidence of complications due to improper pre-hospital and in-hospital treatment of acute spinal cord injury. Discussion: The aims of this study are as follows: (1) We will establish a spine and spinal cord injury treatment database in the Beijing area. (2) We will assess the complete pre-hospital and in-hospital evaluation of spine and spinal cord injury, develop and optimize first aid procedures, and create a pre-hospital and in-hospital standardized training program for the treatment of spine and spinal cord injury. (3) We will build a pre-hospital and in-hospital first aid “green channel” for acute spine and spinal cord injury after completion of the study. (4) We will develop first aid guidelines and establish an evaluation and treatment system for early surgery to save spinal cord function and reduce the degree of disability to the greatest extent as possible. (5) We anticipate that our results will be used in expert consensuses on acute spinal cord injury and that “green channel” patterns will be promoted in hospitals in Beijing and other cities of China to improve the level of first aid treatment of acute spine and spinal cord injury in Chinese cities and reduce the occurrence of secondary injury and severe dysfunction due to improper treatment. This trial will begin in May 2017. Patient recruitment will be finished in August 2019. Analysis of all data and results will be completed in December 2020. Trial registration: ClinicalTrials.gov identifier: NCT03103516. Ethics: All protocols will be in accordance with Ethical Principles for Medical Research Involving Human Subjects in the Declaration of Helsinki (2013), formulated by the World Medical Association. The study protocol has been approved by the Medical Ethics Committee of Peking University People's Hospital, China (approval number: 2016PHB136-01). Informed consent: Written informed consent will be provided by legal representative of participants. 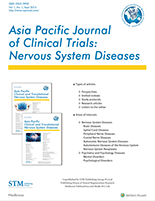 Background: Scalp acupuncture formed by combining traditional Chinese acupuncture techniques and modern theories in medical anatomy has been widely used to treat ischemic stroke in China, but effective clinical trials that verify its efficacy are lacking. This study proposes to verify the effects of Lu's scalp acupuncture on ischemic stroke by comparing differential improvement of motor function between conventional rehabilitation alone and conventional rehabilitation with Lu's scalp acupuncture. Methods/Design: We will conduct a randomized, controlled, parallel, clinical trial. We will collect 116 ischemic stroke patients with dyskinesia from Longhua Hospital, Shanghai University of Traditional Chinese Medicine and Huashan Hospital, Fudan University in China. All patients will be equally randomized into either a control group (conventional rehabilitation) or an experimental group (scalp acupuncture + conventional rehabilitation). In the control group, patients will receive conventional rehabilitation according to the Guidelines for Stroke Rehabilitation in China. In the experimental group, conventional rehabilitation will be supplemented with oblique acupuncture at approximately 30° and an insertion depth of 25–35 mm in the anterior oblique line of vertex-temporal (MS6). Twisting speed will be 200 times per minute. Acupuncture will be performed 30 minutes, once per day. Patients in both groups will receive rehabilitation five times per week for 8 consecutive weeks. The primary outcome will be the difference in Fugl-Meyer assessment motor function score between posttreatment (4 weeks, 8 weeks, and 6 months of follow-up) and baseline. The secondary outcomes will be differences in the Modified Barthel Index, stroke-specific quality of life, and stroke syndrome of traditional Chinese medicine. Discussion: This trial will provide objective data on the effectiveness of scalp acupuncture in ischemic stroke patients with dyskinesia. Trial registration: ClinicalTrials.gov identifier: NCT03120650. Ethics: The study protocol has been approved by the Ethics Committee of Longhua Hospital Affiliated to Shanghai University of Traditional Chinese Medicine of China on 23 October 2013, approval number 2013LCSY056. Informed consent: Written informed consent will be provided by subject guardians.